In the final part of his study on planetary-atmospheric co-rotation, Tim Cullen extends his heuristic formula to the inner planets, with surprising results. 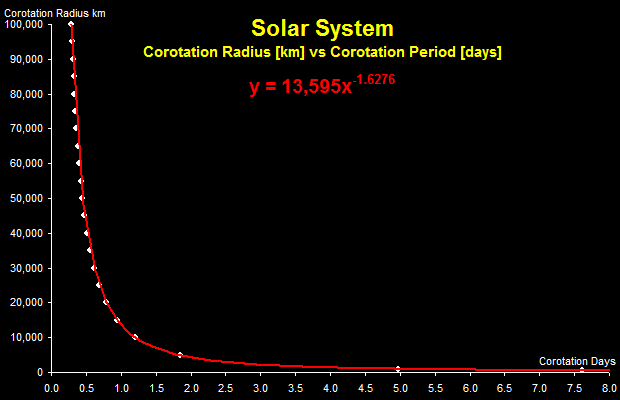 The second part of this post calculated a generalised view of the relationship between the “Corotational Radius” and the ”Corotational Period” of the planets in the Solar System. This third [and final] instalment examines whether these generalised formulae have any predictive ability when applied to the Terrestrial Planets with atmospheres. Precise measurement of the rotational periods of Mars, Earth and Venus allows the generalised formula to be used to predict an atmospheric “corotation radius” for each planet with an atmosphere. The predicted “corotation radius” for Mars is 13,040 kilometres. Unfortunately, I haven’t [yet] found any published papers that provide detailed information regarding the corotation of the Martian atmosphere [so please comment if you know of any]. The dawn-dusk flow asymmetry is of particular interest, because it relates to the ionosphere/upper atmosphere co-rotation and super-rotation at Mars and Venus. Additionally, I have located a diagram of a “non-thermal oxygen spatial distribution in the meridian plane” for Mars [generated by a Monte-Carlo simulation] that indicates the oxygen atmosphere extends [at least] to 13,000 kilometres. 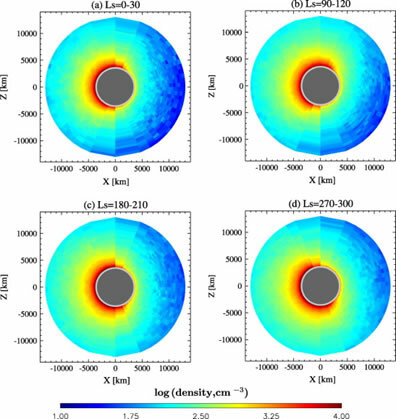 Non-thermal oxygen spatial distribution in the meridian plane. Z is along the North/South poles of Mars and X is set so as XZ to be meridian plane. Therefore, there is supporting [but not conclusive] evidence that suggests the predicted atmospheric “corotation radius” is within the realms of possibility. The predicted “corotation radius” for Earth is 13,656 kilometres. In the case of earth’s magnetosphere, external stresses imposed by the solar wind impede corotation beyond the plasmapause at about 5 earth radii distance [e.g., Brice, 1967]. Modern satellite images [in the ultra violet spectrum] provide an accurate picture of the Earth’s plasmasphere where the circular boundary of the plasmapause can be clearly identified on the night-side of the Earth. 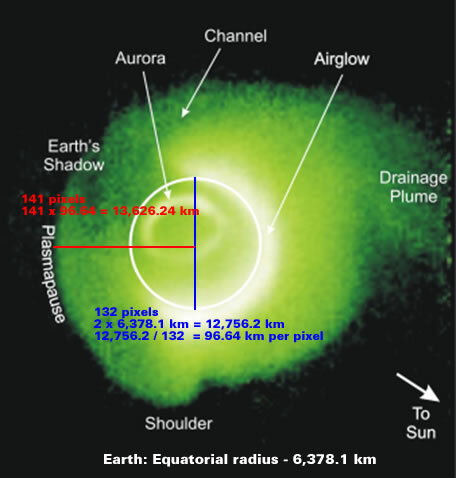 Using “pixel counting” it is possible to calculate a radial distance to the plasmapause of 13,626 kilometres. Although this technique is “subject to some interpretation” it does provide supporting evidence validating the 13,656 kilometres prediction. One of the more interesting aspects of the derived formula is that it calculates a specific “Corotational Radius” for each “Corotational Period”. This becomes intriguing when there is evidence showing the Earth’s “Length of Day” [corotation period] has been slowly increasing for million of years because this implies the atmospheric corotation radius has been slowly declining. 400 million years ago, years lasted 410 days, meaning that days were 21 hours long. This is because the Earth’s speed of rotation was once much faster than it is today. When the Earth formed, a day was around 6 hours long; it has been slowing gradually, but slowed more rapidly when liquid water began to form (~3.5Ga). Unfortunately, the concept of a shrinking atmosphere can be interpreted in several ways, such as a loss of atmospheric gases [to space] or increasing air pressure. No doubt there are many other possible interpretations. The predicted “corotation radius” for Venus is 1.7804 kilometres. Clearly, this is a massive failure because the radius of Venus is 6,051.8 kilometres. However, Venus is worthy of further examination because it might provide some insight that explains why this prediction failed – but [needless to say] Venus is a very controversial topic. One of the curious facets of Venus is its long rotation period of 243.018 days. In the context of the formula predictions Venus should be a large rock – not a planet. But Venus is a large terrestrial planet that happens to rotate very slowly. Another curious facet is that the atmosphere of Venus does not corotate. The wind speed increases with altitude until [neat the clouds tops] the atmosphere has become super-rotational with a rotational period of about four days. The solid body of Venus rotates very slowly, with a period of 243 days, in the opposite direction to the general rotation of the solar system. The general circulation of the Venus atmosphere is dominated by rotation of the atmosphere in the same direction as that of the solid planet but increasing in speed with height from the surface up to the cloud tops. It reaches maximum speed near the cloud tops, where the rotation period is about 4 days. Atmospheric dynamics are thus very different on Venus and on Earth. Coriolis forces are relatively weak because of slow planetary rotation. Instead, the atmosphere itself develops a rotation by internal mechanisms that are not yet fully understood. The remarkable spin of the Venusian atmosphere is one of the major puzzles in atmospheric science. In the absence of forcing mechanisms, friction and wave drag would be expected to bring the atmosphere into co-rotation with the solid planet. Surprisingly, for the mainstream, the superrotating upper atmosphere is transferring momentum downwards towards the surface. Maintaining superrotation in Venus’ atmosphere is a concern, because the faster, high-level regions and the slower, lower-level regions exert drag forces on each other. This tends to slow the air at the higher levels and speed it up at the lower levels, producing a transfer of angular momentum downward. Evidently, this “top down” transfer of momentum is being explained away by the creative modelling of “vertically propagating waves” and “Hadley driver cells”. Although this “top down” transfer of momentum is not [apparently] referenced in the context of the climate it may well contribute [via compression and/or friction] to the “anomalies with Venus’ surface temperature”. Some of the unique elements that are discussed are the anomalies with Venus’ surface temperature (the huge greenhouse effect causes the surface to rise to 460°C, without which would plummet as low as -40°C), its unusual lack of solar radiation (despite being closer to the Sun, Venus receives less solar radiation than Earth due to its dense cloud cover reflecting 76% back) and the juxtaposition of its atmosphere and planetary rotation (wind speeds can climb up to 200 m/s, much faster than Venus’ sidereal day of 243 Earth-days). Bengtsson, L.; Bonnet, R.-M.; Grinspoon, D.; Koumoutsaris, S.; Lebonnois, S.; Titov, D.
Interestingly, this “top down” transfer of momentum may cause the planetary rotation period to [very slowly] decrease i.e. the planet begins to spin more rapidly. In a geological timeframe this would slowly reduce the drag on the upper atmosphere and [probably] result in a corotating atmosphere with [based upon the predictive formula] a corotation period of about 1.6 days. By the time our planet has rotated around the sun, we will have seen one point on the sun 13 times. If our planet did not orbit the sun, how many times would it have rotated? Venus is the only planet to rotate backwards. That would have a vast amount of friction against it by the sun comparing with the rest of the planets that generally are in sequence in rotation. Well, I think the coincidence of Tim’s formula with the Earth’s plasmasphere diameter is pretty cool. It’s appropriate that the theoretical corotation period for Venus pans out at 1.6 days too. Phi times Earth’s axial period. Earth and Venus’ orbital periods are in the golden section too. Some more Earth/Mars/Venus comparison data here. With so little Angular Momentum, Venus will be more easily affected by other solar sys perturbations and solar variability. But [I reckon] you need to define your driving mechanism first. There is talk of 500mph winds on Venus. It would take 50 hours to go round the equator at that speed. Venus will be more easily affected by other solar sys perturbations and solar variability. There is talk of 500mph winds on Venus. Rotating in the same direction as the planet? Ultraviolet surveys of Venus show a Y-shaped pattern of cloud formation near the equator indicating that the upper layers of the atmosphere circulate around the planet once every four days, suggesting the presence of winds of up to 500 km/h (311 mph). These winds exist at high altitudes, but the atmosphere at the surface is relatively calm, and most images from the surface reveal little evidence of wind erosion. My mistake. Make that 80 hours then. If, circa 70 million years ago, Earth had four times the present pressure (in order for all those Archosauric megafauna to function), what was its rotation rate at that time? This fits into the same category (to me) as that essay regarding the obvious high heat of Earth’s interior– and how it simply *cannot* be left over from the aggregation process of 4 billion years ago…. We need one of Mr. Wells’s machines to go look! Miles Mathis questions existing Coriolis theory, proposing magnetic forces instead. would not expect Venus to comply with such a rule. 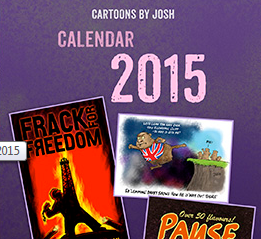 Its day is nearly as long as its year and it is turning backwards. This suggests strongly that it has had a “troubled childhood” and suffered at least one massive impact that inverted its rotation. It seems to go agains so many other patterns of solar planetary patterns , I would be more surprised if it did fit than if it didn’t. Why doesn’t Venus have a moon? What could have cause it to lose a moon? What effect would a moon deorbiting have on the surface?